Wales boss Chris Coleman is set to open talks about a contract extension with the Football Association of Wales. Coleman, whose current deal expires this summer, is expected to be rewarded with a new contract after guiding Wales to Euro 2016. The 45-year-old is the first Wales boss to qualify for a major tournament since Jimmy Murphy at the 1958 World Cup. "Ideally we'll know what we're doing before we go to the tournament so everybody is settled," said Coleman. The former Fulham manager will meet FAW chief executive Jonathan Ford and president Dai Griffiths to discuss whether to extend his four-year tenure. Who will make Wales' Euro 2016 squad? "In fairness to the FAW, at Christmas they said let's sit down, so they were pro-active," said Coleman. "But we've had so much going on trying to prepare for this tournament and we said the best time will be March, so next week we'll sit down and discuss it. "If the talks go well and everything is fine, then brilliant. But if we're miles apart on different things, then let's just concentrate on the tournament." Coleman said he did not want to get "sidetracked" by the issue, saying the focus needed to be on the championships. "We've worked so hard to get here, that's all that matters," he said. "What comes after, comes after." 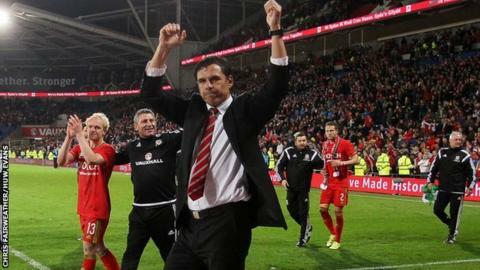 Coleman was appointed Wales boss in 2012, succeeding good friend Gary Speed following the former Wales captain's death. He signed a two-year extension in 2014. FAW chief Ford had previously said: "I'm very confident, knowing Chris very well, that you don't just qualify and then leave."